YouTube is undoubtedly the winner of video sharing on the Internet. But after adding Google+ comments, it has faced much criticism. There are many people who want to share video anonymously. For those people, there is a nice video sharing website Viddme. It lets users share video anonymously. Viddme is a nice service where you can upload and share video without creating account. 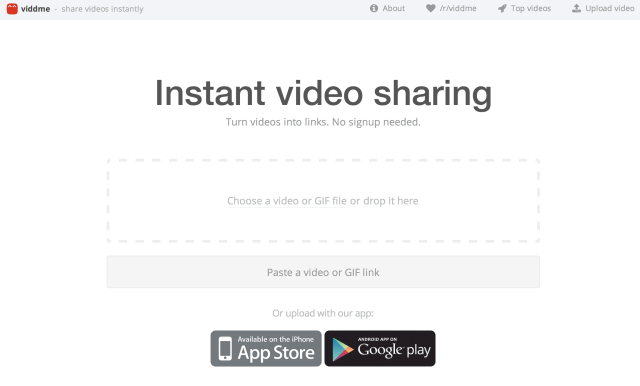 Viddme also instantly shorten the link so that you can easily share it with friends. Just visit the website and upload your video simply by dragging on browser. You can also share animated GIF images and it will convert it into video. Drag video to upload and it will pop a window asking you the title and description of the video. But you can also upload video without adding any title and description. You can also create free account on Viddme to manage your upload video. Unlike YouTube, your real name will never be shown when you share your video. Viddme also offers free iOS and Android app to share videos direct from your smartphone. This is really a nice web application and have ability to get users’ attraction in near future. I personally like the app and recommend this as simplest video sharing app. You can use it for sharing your videos if you do not want to use display your real name.